Transportation on Anna Maria Island is one of the primary concerns. There are many free transportation services through the island. Transportation from the Tampa or Sarasota airports is the primary question many vacationers have as time approaches for their travel to the Island. There are many limousine companies offering transportation that can be found on the internet. Another source of transportation is the Anna Maria Chamber of Commerce. Prices and service will vary. It is important to state your exact needs while travel shopping – e.g. travel dates, and time of arrival, airline scheduled time and flight number, exact number of people in your party and children requiring child seats. The Island is unique. Access to the beach is free and readily available. In many beach communities in Florida beach access is controlled by hotels, motels and land owners. 99% of the Island (Holmes Beach) have set building height at 3 stories. There are no chain stores or fast food chain businesses on Anna Maria. The vast majority of shops are small business offering their unique wears. You want to get away from the fast pace world – your here. 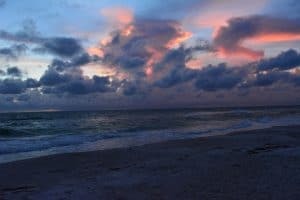 Free transportation on the Anna Maria Island – yep! Operating daily from six o’clock in the morning until ten o’clock at night and operating every 20 minutes, 5 new, green Anna Maria Island Trolleys operate 365 days a year up and down the entire length of Anna Maria Island and surrounding area, including Sarasota, carrying only happy passengers. The Beach Express operates Sundays and holidays from 9 a.m. – 5 p.m.
Island Beach Monkeys is a new, free transportation service. Their fleet is available to drive you wherever you want to go. Want a ride to dinner? Need to run errands? Want a tour of Anna Maria? Our team of friendly drivers is at your service! The drivers offer their service for free, but it is customary to tip the driver an appropriate amount. The island offers many free shuttle services. Once here you will see a large number of electric golf carts roaming the streets. Watch for the ones that display a shuttle service sign. The drivers offer their service for free, but again it is customary to tip the driver an appropriate amount. They will take you to any part of Anna Maria Island you wish.